What a weekend. The blog was read by more people over the last three days than in the whole of both 2012 and 2013 combined. One minute, you think you’re quietly sharing some thoughts with the 300 or so regular readers, who have most of the context for what you write and think – and in the next, you open your eyes to realise that you’re suddenly (loudly!) addressing a stadium. And while you’re chilling by the pool at a friend’s house, drinking castle lite and eating their banting bread, talking about babies and new jobs and whatever happened to whats-her-name, you’re unwittingly being co-opted into thought movements and ascribed an agenda and collecting a surprisingly inventive amount of hate comment (now marked as spam). It’s awesome, and entirely overwhelming. So thank you all for sharing and visiting and commenting. So on with the post, and I want to start clearing through some of the questions that came up in the comments. And I’d like to begin with the very thorny issue of companies, and whether they’re taking advantage of their employees. Basically, I suspect that this really boils down to a belief that companies ought to pay their employees as much as they can afford. So put aside the labour market and the competition for jobs – it’s just unethical for a company to earn millions and not pay some of the millions to the hard-working people that generated those millions. It’s at this point that you might expect me to get a bit preachy about the fundamentals of the labour market, and how demand and supply works, and that your salary is actually a function of how many colleagues you have and how much they’re willing to work for – rather than how much the company is able to pay. But I’m not going to do that. Because although that might well be true in some cases, I think that there is a mistaken assumption that, somehow, companies make millions. So let me take you back to the tax statistics (especially after they served me so well last week). In the most recent set of tax statistics released by SARS and the National Treasury, there were 625,808 companies registered as taxpayers (including close corporations). 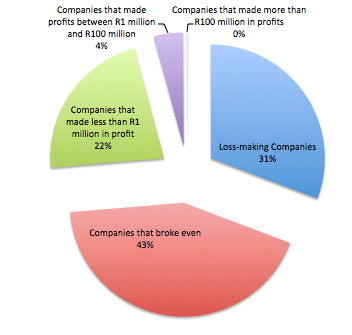 0.09% of companies make more than R100 million in profit. 4.22% of companies make more than R1 million in profit. The other 96% of companies are either loss-making, breaking even, or barely making any profit at all. What I’m trying to say is: I think that we’re guilty of some representative bias. We read about the 522 companies or so that are making lots of money, and we don’t hear about the fact that most companies are quietly ticking along, making just enough money to pay their staff, if at all. And the trouble is that 70% of employment in South Africa come from those small and medium-sized enterprises* – the ones that are mostly sitting in that 96%. *that’s according to this report from JP Morgan. As an aside – I acknowledge that there will be some companies engaging in clever tax plans. But you also have SARS conducting audits on these companies, looking for instances of illegal tax evasion. Either way, even if you account for some tax planning, I doubt that you’ll be seeing a radical change in that 96% number. So that’s the first problem with the feeling that employees should be paid more: almost none of the companies that we work for are making millions. But there is a second problem. Those earlier statistics take into account assessed losses (it’s why you had so many companies “breaking even”). And it’s important to note because while the company might have made a profit this year, if it made losses in previous years, SARS allows it to offset the two, and “break even”. And in case you think about this as a benefit – it is not. It is fundamentally necessary. If you make a loss, that loss needs to be paid for. The company will have to borrow money, or use up some cash reserves, in order to pay for the expenses that are not being covered by revenue. It’s just part of the business cycle: companies make profits in some years, and make losses in others. During the bad times, companies have to raise money (through borrowing, selling off assets, or new capital investment by the shareholders) to keep themselves afloat; and in the good times, companies use their profits to repay the borrowed money, replace their assets, and build up reserves against the next bad time. And from what I’ve seen in the most recent downturn of the business cycle in South Africa, most companies will do almost anything to avoid lowering the staff wage bill during a loss-making year. They might freeze hiring and discretionary bonuses, or do some retrenching if they absolutely have to – but in general, business owners are far more likely to indebt themselves before they try to negotiate salaries downward. It’s just too negative an impact: staff morale plummets, and retrenchment packages mean large amounts of upfront cash payments – to say nothing of the possibility of disruptive union action. The other side of the equation is: during profit-making years, while employers may give out discretionary bonuses and do some more hiring, they’re not going to raise the fixed wage bill to levels that they might not be able to sustain in a downturn. There may have been R534 billion of taxable profits made by some companies in 2012, but there were also R442 billion of taxable losses that were made by other companies. So if you’re to average that out between the 625,808 companies, it means that the average South African company only made about R150,000 in taxable income in 2012. The point is: companies don’t make millions for years on end – the ones that do are outliers. The other problem that I have (speaking as an accountant) is that “current year profit” really is the wrong number to be looking at. “Profit” is just the difference between sales and expenses in the last financial year. It doesn’t include the history of bad years, nor does it take into account big cash outflows like “amount of debt repaid to the bank” or “purchase of capital equipment”. Those are not considered expenses – but eventually, they need to be paid for out of profits. I still believe that salaries and wages are generally set by the market: companies will pay market-related salaries, rather than “what they can afford”. But we need to expand the way that we think about that market. The demand for labour is not created by a collection of rich companies, greedily rubbing their hands together as they pay peanuts. Most of the demand for labour is created by the 96% of companies that don’t make much profit. And by the look of their losses and utilisation of assessed losses, they are paying what they can afford. And that creates the market salary benchmark – which only a few really successful companies get to benefit from. So perhaps those companies are unethical. But even if they are, they’re in the minority. I thought your blog was a Christian blog about the Alpha Course…….so I didn’t ever look at it. I am a Christian, church going, and often post Christian things on Fb….but not Alpha. Last week I actually read your blog. Thank you, I am a convert…..
What do you mean that you only have 300 or so regular readers?!? I’ve been following your blog for well over a year and thoroughly enjoy it. It deserves more readers! If you’re ever in Cape Town, please let me buy you dinner or something. I hope the banter would be interesting (I have much less financial skillz, but now I am doing all sorts of interesting tech stuff).